Ask fellow campers about "Spaulding Lake Campground" and nearby attractions. Our site was a pull thru VERY close to a long term camper. Trees were very close and prevented any satellite coverage. A few antennae stations received. WIFI and verizon were adequate. Site was dust when we arrived and mud within a few hours of a rain. There had been a huge rug recently removed and was a large muddy indentation. Sewer and water the closest I have ever seen and in need of some updating. Water pressure was fair. A lot of older campers that appear to be seasonal. Smokey camp fires 24 hrs. We camped at Spaulding Lake Campground in a Motorhome. The site was level with central hook ups. The water and sewer drain were literally right on top of each other, a little too close for me. The wifi and tv antenna worked ok at the site. The restrooms were older and probably a little harder to keep clean. The owner is on site and very helpful. At check in you get a local map with all the things you may need while traveling such as stores, wal mart, fuel, hospital, etc. We camped at Spaulding Lake Campground in a Fifth Wheel. Older worn park. But clean and friendly. Easy in and out, hook ups worked well. Ten minutes to nearest Walmart. About 35 minutes to Michigan City on lake Michigan. Sites are mostly dirt some are grass. We camped at Spaulding Lake Campground in a Fifth Wheel. Nice quiet family owned campground. It was crowded on Memorial Day weekend, but they found us a spot for one night. Some small ponds for fishing and a small swimming hole. Very friendly and helpful owners. Good service, good wifi. Would stay here again. We camped at Spaulding Lake Campground in a Tent Trailer. We spent five nights in May 2018 at Spaulding Lake Campground in our 39' fifth wheel. This was our second stay at this campground and we enjoyed it again. 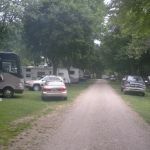 The campground is well maintained and the staff is very friendly. Our site was a gravel pull-through and was adequately long to accommodate us. There was a decent amount of room between us and our neighbors. There were mature trees all around us and the three ponds were a short distance from our site. The campground is far enough from the highway that it is very quiet but close enough to retail businesses such as Walmart. The only discount given is for seniors. We will stay there again when in the area. We camped at Spaulding Lake Campground in a Fifth Wheel. Don't drink the water, turns turbid to milky when boiling for coffee. Grumpy owner with lots and lots of rules and signs. I expected more for this price and after reading others' reviews. We camped at Spaulding Lake Campground in a Fifth Wheel. Stayed with friends, older campground, a little rough around the edges, could use updating. Near town and South Bend Indiana. Other than that a nice campground. We camped at Spaulding Lake Campground in a Fifth Wheel. Many stores, museums nearby. A good location to operate from. Stayed here, six of us, and found it expensive. $246.00 for the six days we were here because they charge extra per person above original price. So, for a mom and dad, they then charged extra for each of our four kids. Unfair pricing. Especially when the bathrooms are small and only kinda cleaned, showers with tiny stalls and lame pressure, and very small sites, most of them in the blaring sun. It does have nice fishing ponds and a quaint playground but even that is spoiled by a persnickety, nosy old man owner on a golf cart scolding campers for having a bicycle "across the line and into the next lot". The next lot, empty! Also, he is riding around staring at us on our site, looking for infractions "against the regulations". If not him, another man, the groundskeeper, on his golf cart, haranguing the kids at every turn. Not fun, and not welcoming to kids, I feel they really only want the fancy motor homes and people who never step foot out of their air conditioned, TV, Not Camping outfits. Skip it here and try the state parks, more fun. Less nagging. We camped at Spaulding Lake Campground in a Travel Trailer. Fort St. Joseph archaeology site, Niles museum, Lake Michigan...Martin's deli is amazing, Starbucks inside! This park is good for an overnight stay, the pull through sites are a little tight and you may need double length hoses. Lots of young families and a big play ground for them. It is a little off the beaten path for a over night from the highway. We camped at Spaulding Lake Campground in a Travel Trailer. Price reflects a 7-night stay. Gravel interior roads and grass/gravel sites. Has back to back sites and some long angled pull-throughs where you share the pedestal and water. Other angled long pull-through sites you don't share power or water. Has a few back-in sites with no neighbors to the back of you. Lots of trees but also open areas for those who have a satellite dish. A few short little trails around the park. Three little ponds. Wi-Fi was excellent. Was able to bring in twenty channels on the TV antenna. Allows campfires. Do hear road noise. Water pressure is low. Glad we have a Oxygenics shower head. We were in two straight back to back sites which was strange since there were plenty of big angled pull-throughs available during our stay. Easy in and easy out with a 60 ft combo. We camped at Spaulding Lake Campground in a Fifth Wheel. Stayed while in area for motorhome renovations. Older but well-maintained campground. Sites gravel/grass on packed ground, reasonably level. Owners and staff friendly and helpful. Small fishing ponds (no license required), playground with old equipment but lots of games (basketball, tetherball, etc). Good WiFi (but we were here near end-of-season without many other campers). We were in the open but unable to get satellite because of high surrounding trees. Several good OTA channels. AT&T LTE signal good. South Bend, Mishawaka ~20 minutes away. Many wineries/breweries within ~30 minutes. Will return if in the area again. Cash & check only. We camped at Spaulding Lake Campground in a Motorhome. South Michigan Wine Trail nearby. Plenty of shopping within 15-20 minutes. An older but well-maintained park. Lots of activities for kids. Fishing, play ground, basketball. Some of the sites appear to be longer term rentals, but all are well-maintained. The site was long enough to remained hooked up overnight. Full-hookups. The laundry facilities were very clean and only $1.75 to wash and dry a load. We camped at Spaulding Lake Campground in a Travel Trailer. Nice park. Sites are large. Sites are fairly level. Not readily marked as they are grass/rock. Some turns within park are tight. We camped at Spaulding Lake Campground in a Motorhome. Convenient to Notre Dame. South side train to Chicago and back from airport is fun. Corvus has good pizza. O'Rourks has good food and drink. Our biggest surprise with this private campground was the large amount of land they have surrounding the campsites. Most campgrounds put RVs on almost the whole property, with maybe a small plot of land reserved for a playground or dog run. Spaulding Lake had huge grassy fields, a small forest with trails winding through it, a swimming lake and a fishing lake, and a pretty creek flowing all around the campground. 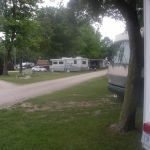 The entire place is surrounded by tall, thick trees, providing great privacy (the campground is in a residential neighborhood). We found plenty of places to walk our dog, and he went for a few swims in the creek, but there's no enclosed off-leash dog area. As others have mentioned, half the sites are in a wooded section with shade and mature trees, the rest (including ours) are in a mostly open grassy field. Our site was grass instead of gravel, but we had no problems, even with two full days of rain. Site size was above average, utilities worked well, and even the WiFi worked well most of the time. Verizon and AT&T both had strong signal. The owner was very friendly and helpful, and we appreciated being able to receive mail and packages while staying here. This was a great place for us to stay while visiting Elkhart and surrounding areas. We would return here. We camped at Spaulding Lake Campground in a Motorhome. There's a BBQ restaurant about 1/4 mile from the campground. We got take-out once and it was quite good (but a bit pricey). Temporary stay while we visited investments in the area. Convenient to highways yet far enough to reduce highway noise. Sites were hard packed and clean, with easy access. Friendly staff. Did not use the amenities to cannot comment, but I am sure they were satisfactory. We camped at Spaulding Lake Campground in a Fifth Wheel. If you go here, you will have to ask for a picnic table and fire ring if one isn't on your site. They remove them for mowing purposes. Beautiful walking trails there. Clean park. Town is 3 miles away. Are you affiliated with Spaulding Lake Campground ?